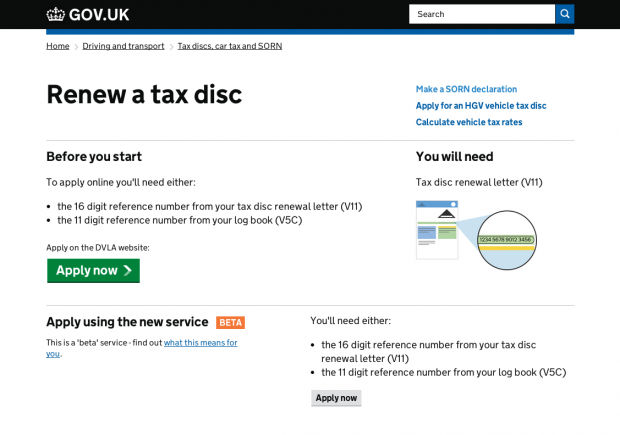 The renew a tax disc service is one of the most popular services on GOV.UK. We recently redesigned the start page for this transaction to make it easier for visitors to access the new version of this service, whilst keeping the existing service also in place. The new start page presents the existing service at the top of the page with the newly designed service as an option beneath it. This has been successful in making sure the new service doesn't attract too many people — around 3–4% of visitors take this route. As we gradually move closer to the new service becoming the default, the DVLA has a new challenge: to encourage more users through the new channel in a controlled way — we don't want to overwhelm the service, but at the same time we need to put it through its paces and increase traffic. The solution we have come up with in collaboration with the DVLA is to serve up alternative versions of the service ‘start’ page to users, using A/B testing techniques. A/B testing in this context essentially involves presenting two versions of the page to different users (shown in the figures below). Initally with the multivariate test in place, 1 in 5 visitors saw the new service as the main option and 4 in 5 visitors saw the new service as the secondary option. This worked successfully. We saw an increase in visitors to the new service. Having continued to monitor how this has performed, we recently increased the split further in favour of the new service. It's now a 50:50 split. The new service as the primary option. Initially seen by 20% of users, now seen by 50% of visitors to GOV.UK. The new service as the secondary option. We'll be watching how this performs and it's likely we'll again increase this ratio further in favour of the new transaction sometime soon. This is the first implementation of multivariate testing on a GOV.UK start page. If there is space amongst the other work we have to do, we may consider doing this again in the future. Daffyd Vaughan at the DVLA has written an interesting post from a DVLA perspective of this update. 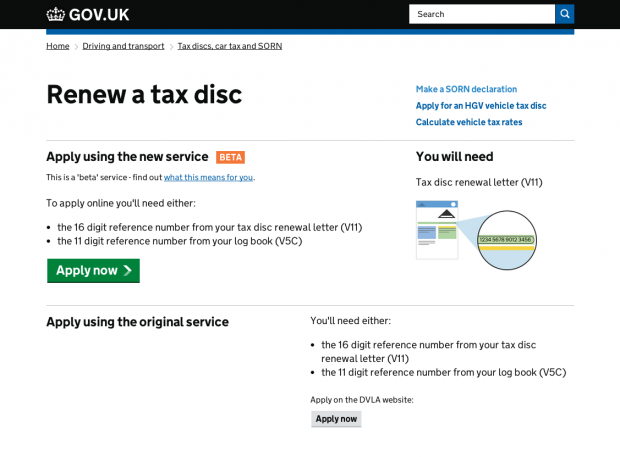 Read his post about the next phase of the tax disc beta. Interested to know what service you used for MVT, and how those metrics will shape future design decisions? I'm not a developer but have spoken to one of our team and this is what we are using for MVT. It is based on Cohorts. In this instance we're not using the testing to inform a design decision so much as to control the flow of traffic to two versions of a service until such a point that the new version becomes the default. That said, I'm sure we will be using MVT more in the future to help inform interface decisions to make things better for users. As and when we do, I expect there will be blog posts in the offing outlining what we've done.